This is the circuit diagram of a fully transistorized sub woofer amplifier that can produce an output of 100W.There are seven transistors including four in the output stage. The transistors Q1 and Q2 form the preamplifier stage. Transistors Q4 to Q7 form the output stage. Since no ICs are used the circuit is very robust and can be easily assembled on a general purpose PCB. If you are not familiar with the basics of electronics, CircuitsToday has provided a list of 4 really good books to learn the basics of electronics. To get a better practical knowledge in the subject you can buy these books from here:-Â 4 GREAT BOOKS TO LEARN BASIC ELECTRONICS. The circuit can be powered from a +35V/-35V, 5A dual power supply. Use a 100W, 12 inch sub woofer at the output. All electrolytic capacitors must be rated 100V. The transistor Q4 to Q7 must be fitted with heat sinks. you can use 0.47ohms 5watt 0.5ohms 5watt or any other close to these values, there will be no problem. plz tell me the circuit of 250 watts operating by 12 volts. I have built this circuit and it is working fine. I had power up with +/-27 volt and sound is very clear and clean. But C2 polarity shown wrongly in this circuit. With wrong polarity of C2 amplifier will not work and R13 will brunt. So keep +ve side of C2 towards GND. could you please explain the 27v power supply for me. where can get the crossovers/stereo from? I’ve built this circuit but it doesn’t work. Resistor R16 and R14 are heating up and I’ve used a 24-0-24V/5A transformer which gives a DC output of 36.7V. Any workaround for the heating problem would be appreciated. Please send me the Power supply circuits for 2.5-4 amp, 24 volt DC power supply. I need this circuit , my 01 machine is under B/D due to brunt of same powe supply. Is this circuit only a low frequency amplifier or it is just a high power amplifier? What I mean is, will the subwoofer connected to it produces only low frequency effects or both low and high frequencies combinedly when connected to a 2 channel auxiliary analog sound input(like the mobile phone)? I want to know where to put the volume control for this! Plz tell me the position and rating of the control. Can any one tell me the minimum voltage and current that we can apply ? Can you please help me with the explanation of functions of each component for the whole circuit. Please. @burhan – we dont sell this as kit now.We will definitely add this kit later! so, I’ll be using a low frequency pass filter from a pre-built multimedia speaker system. & I don’t have any problems regarding the circuit. but, I am unable to find or harness the input voltages which are +/- 35V. what should I be doing to, get those voltages. what rating of transformer should be used? Well that was a stupid question which I asked. I should be using the low pass filter. so, the last remaining doubt for me, is Power supply. what should I do? and will it put 100W Rms into a 8inch 100W subwoofer when the Input voltage is +/- 35V ? should the input fed into the circuit be after processed low frequency ? or could it be normal stereo input ? and as this circuit is based on transistors, should the power supply a AC supply be used? i’m unable to find +/- 35V power supply. all I could find is a 14V AC which when Rectified gives a total output of 18~19V DC. so, what should I be doing? Thanks in Advance. Can i use 1/4 W resistors instead of 1/8 W resistors. Is there any 300 watt stable Amp circuit to drive 4 Ohm subwoofer? I got one circuit on below linkâ€¦â€¦.. Is it good for my CAR subwoofer? I got one circuit on below link…….. Is it good for mu CAR subwoofer? Convert -> Normal -> Sub ????????? https://www.dropbox.com/s/hfbutrjfovjimt8/100W%20Subwoofer%20Amplifier.zip?dl=0 this is the pcb layout comes from sir seetharaman. Install pad to pad software to open pcb file. Thank you very much sir for the layout. Hi Sir… can you please send me your PCB layout of this circuit.Thank you in advance. God Bless You. Hi Sir Seetharaman can you please send me your PCB layout of this circuit.Thank you in advance. God Bless You. I was using this amplifier for past 3 years i checked my amplifire recently and i found the resistor R13 100R 2W is blown. it is not actually blown but it is burst out.i replaced with a new one and i found that while working the R13 is getting very hot but the amplifier is working properly. please help me to resolve this problem sir. Make it 150-200Ohm 2 watts. use the high quality pre amp (nokia samsung etc branded phons) to the amp high quality sound.with out tone sercute. wow…i made this sercute solidsound..
Sir in mfb amplifier if i use TIP35C and increase the supply to 70V what will be output power? What about the sound quality sir still the same? Sir can you pls give me a diagram of bridge output transistorized amplifier. can u send photography of ur circuit…. I have a pair of car Speaker with old magnetic car tape And also have a 12v power eliminator to connect at home but this is old fashion. Now i want to make a circuit that connect to my mobile to play the music. Using these sound and 12v power suppyer. So please help me to make it working. Also want to know what components should be required to make a circuit. Sir can i use BC557 instead BC108? sir..i made this circuit…i designed the PCB and buld it…but it works in best way for 3 mins and then lower the sound and produce a humming sound with varying bass sound… one 3773 transister is heating up… i cant understand why it is happening… can any one help me…. thanks..now it is working properly…nice..
my question is that i can not get the transistor 2n3773 because in the circuit diagram you have shown three legs of that transistor but in market it has only two legs.could you please tell me the substitution of that transistor or please guide me because i have to submit my final project in two weeks. please help me………. Hi sir, I have tda7294 sub woofer, witch is the best sound quality, tda 7294 or your 100 wat trans..? hi sir which is the best for subwoofer amp. this circuit or 150 watt amp circuit.???? i want to make subwoofer amp. Hello sir,can i use 12v input to the amplifier? if yes pliiz provide the circuit containing 12v input signal. another request sir…please send me the dual 35+/35- power supply circuit of the amplifier. Hi sir! is this ckt need separate transformer? or can i use tip 142 and 147 150 watt ckt’s powersuply. if i connect like that, is this both amps output transistors will short? Any problem when can i connect 10inch 4ohm subwoofr on this circut. If no problem how much power will get? Can i use 25v 5amp ac to the circut? Why this funny question? use supply voltage as recommended in the project. you can use a 25-0-25 5amps transformer with rectifiers smoothing capacitors and 6amp bridge rectifier (See 150 watts amplifier circuit for the power supply circuit). which will give you +35 -0- -35 volt DC for the amplifier. Hello, every one can i attach Q4 to Q7 in one heat sink and also give the perfect size of heat sink for this project thanks please reply I m waiting . I managed to build the circuit and on an ossciloscope the readings look correct but when i connect a speaker instead it shorts on the negative end of the circuit. Any idea how to fix this? Any help would be greatly appreciated! pls sir I made another circuit of dis same amp n I don’t want to use these 2n3773 due to insulation issue, pls sir can u tell me any 3 pin transistor Wich will b as good as d 2n3773 ? I tried using 2sc5200 but d sound isn’t as good as d 2n3773. Did anyone make this circuit? I have la4400 circuit what transformer it require for input power. please specify me that are there any connection wire for bass in la4440 and i will connect 2 woofer speakers as 80w with 8â€³,let me know if I am wrong that at first i need a transformer to connect to la4440,where to connect the volume,bass connection. here we have mac 8″ can i use. what type of woofer I must use name please. or give me a name of circuit to connect 8″ to 12 ” woofer. This IC is a car amplifier chip to handle car battery voltage . you can use 13.2 volt DC. A 0-9 volt transformer rated for 2 amps is more than sufficient. use a 3amp bridge rectifier and 4700uF 25 volt filter capacitor in parallel with 0.1uf 25volt ceramic disc capacitor. The IC will give 4.5 watt rms output into 4 ohms speaker. So what is the rms output for this 100 watt circuit? english please for a reply. Hi Abubakar No. It will blow the output transistors. Minimum speaker impedance is 4 ohms for this circuit. hi, for pcb of this amp read my comment (rohin). Pls can someone guide me on building dis circuit? I only have a humming sound @ d output.Whr must I have gone wrong? sir please…im waiting for ur reply….pls any one….help…. Hi i like this circuit,please give and send me a printed circuit board for this project. im an university student from Sri Lanka.im interested in this circuit….im going to build it.i have 28-0-28 transformer.can i use it? im going to use 4ohms 10inchs 200W subwoofer speaker.is there a chance to having a PCB desing of this cicuit..pls help…thanks. This amp works great. I was unable to find a 2N5494, but searching through the replies from the author identified similar replacements. The only problem I’m having is the presence of 0.177v at the output with no input. I’ll do a little adjusting on the bench to move the crossover point. Regardless, this works as published. Hai sir, SEETHARAMAN. Does this amp needs preamplifier to amplify below 140htz signals or jst audio output any source will do, can u plz send me the circuit PCB,thanx for the reply. You can connect the input to 5.1 filters sub woofer output. CIRCUIT FOR 7.1 CHANNEL AUDIO. FOR 2 CHANNEL INPUT. ABOUT 300-400 WATT SUB WOOFER,& 50-100 WATT SPEAKERS. Hi Guna with 35 – 0 – 35 volts DC you will get 60 Watts RMS output power into 8 ohms speaker . Hi Guna Normally all non indicated resistances are 1/4 Watt 5% tolerance type. I have a question about the required power supply for this amp circuit.. I currently have a 36-0-36 5 amp per side transformer that will deliver +-35 volts DC after going through the 5 amp bridge rectifier. I also have one each per side 4700MFD 63 volt Electrolytic Cap and one 2.2MFD 60volt Poly Cap per side..
Is this power supply setup too much for the circuit to handle or do I need to by a 25-0-25 transformer to keep from over loading the circuit? A 25-0-25 transformer that delivers 5 amps per side is extremely expensive.. I could build my own transformer but getting the E I type silicon Iron sheets is impossible since I live in America. America doesn’t make anything or have anything to make a transformer except magnet wire only. I got it to work myself. I rewound the secondary on the transformer twice. Once at 25-0-25 which didn’t work very good and then again at 34-0-34 which worked fantastic. The only problem that I’m having is, is with the preamp stage where the audio is being distorted. But neither the less, I have it working and it doesn’t sound to bad. I have it posted on my Facebook page. I had to tweak the hell out of the crossover to make it sound halfway descent. I think that problem with the preamp stage is, is the C2 polarity is wrong. I noticed when I have the volume way down, it sounds perfect but when I crack up the volume it becomes distorted. It would be nice for someone to let me know something. This one has no Filter circuit. Right.? So if we connect this to any input other than SUBWOOFER OUT PUT of a Hi FI set up we should have a filter circuit connected to this first. Right sir.? Forgive my Ignorance. How do I determine the BCE pins of Transistors. I know how to figure out BCE of C828 and D400 transistors but is it the same for these Transistors too.?. All Transistors have the BCE pins in the same way or are they different depending on PNP or NPN. Please explain..Sir..
Hi Janaka if you have a subwoofer output from your dvd player, can be connected directly to this amplifier. If you have only stereo information(left and right channel information) then you have connect through a sub woofer filter bothe channel information to make it as 2.1 information. 2 is left and right .1 is subwoofer signal. 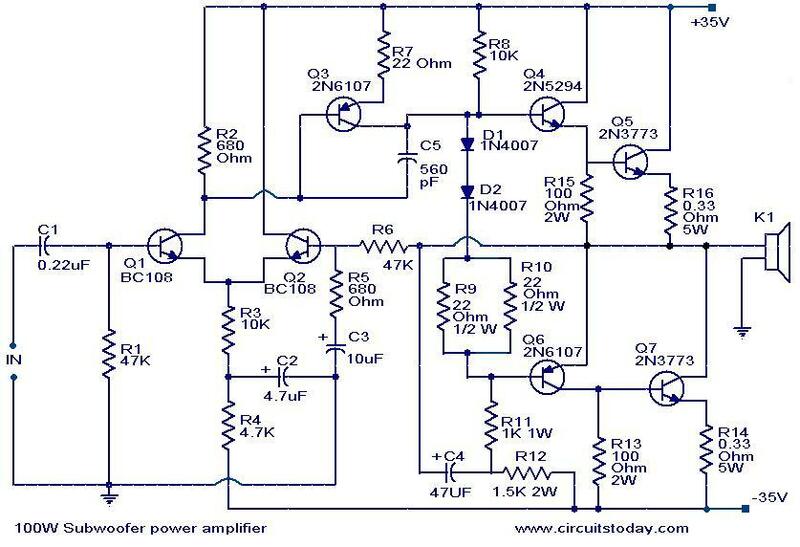 KINDLY SEND ME A CIRCUIT OF 200 WATT RMS SUB-WOOFER AMPLIFIER, ITS OPERATING CURRENT AND VOLTAGE, PART LIST AND PCB. Sir, Forgive my Ignorance. How do I determine the BCE pins of Transistors. I know how to figure out BCE of C828 and D400 transistors but is it the same for these Transistors too.?. All Transistors have the BCE pins in the same way or are they different depending on PNP or NPN. Please explain..Sir..
Can you please send me a simple 2.1 home theatre circuit using Subwoofer. pleas give me the pcb of this circut. can you please give me the PCB layout of this circuit.. Please let me know this 100 watts are PMPO or RMS??? Hi Janaka it is 100Watts RMS power at <1% distortion into 4 ohms load with plus minus 32 volts DC and into 8 ohms load with plus minus 45volts DC supply. thanks for pcb…did u check that ckt by giving connections>>>>? hi vicky, i made 6 amp on this pcb.pcb is working 100%.alternative list of transistor.bc 108 or bc 109 or bc 547 and 2n 6107 or a940 and 2n5296 or 2n 5294 or c2073.2n3773 or 2n3055 or c 5200 or mjl 21194.
how to add volume control in this subwoofer…? hi, you can use any tone control circuit.for a subwoofer you need sub filter circuit otherwise you can add a tone to control volume that is your taste. Hi Shbham Use a 100k log potentio-meter(three tags), preferred but if not available use 100k lin (not rheostat- 2 tags only). connect center of the potentiometer to C1. one end of the potentiometer to common(ground). Connect input between both the end of the potentiometer such that input signal ref is connected to common and actual signal is connected to other end of the potentiometer. Hey there im a student at chisholm catholic college and am working on an engineering project.Just wondering if you have a diagram of a circuit for a 100 Watt sub woofer amplifier that can run off 12 volts. Sir can i get your pcb lay-out !? So that i can build it at my own ..
sir, can i have the design of pcb layout…thanks!!! sir i want to design this ckt please if u have some time please send me your pcb layout sir please i want to try it for my project sir……. Has anyone emailed you the PCB? Sir i am used for 100 watts subwoofer . Which capacitor use? i am using this amplifier for my sub-woofer with KFC W3013 ken wood 12″ Woofer(1200 W peak 450 W RMS) , and i am using sub-woofer filter also i/p of this amplifier , 24-0-24 5A Ac transformer,but when i raise the volume,i am getting poor effect( like vibration DURRRRRR – sorry i don’t know how to explain)with base effect ,i could not understand, what is the real problem , woofer also more than enough wattage rated with proper size enclosure ,transformer 5A rating . any body can please advice me . Hi, please check the grounding.power supply grounding ,volume control grounding and speaker ground should be connected to different ground points. volume gnd should be away from power supply gnd point . can u please send me the list of components by a mail please . i want to try your 100wat subwoofer as my project in school.. can u sent it to me ur PCB layout and so with the components… thanks in advance.. Please send me the parts details of this circuit board & thanks for the idea. Data Processor of Godrej & Boyce Mfg. Co. Ltd.
hiii can u plzz tell me whats d difference between a subwoofer amplifier and a normal 150 WATT amplifier…..
Sub woofer is a Mono Amp giving only the Bass ( Mostly) to a one Speaker. A Normal Stereo Amp is giving both Bass and treble to two Speakers. In a Sub woofer A Filter circuit also used to filter the sound so Treble can be minimized giving only the Bass. but again in a Normal Stereo Amplifier Filtering is not required. It gives both Bass and Treble equally. i have a question in my mind that is dre any way to increase the output power of this amplifier? here’s one thing in my mind that if i use multiple transistors (2n3773’s) at the ouptput then is there any chance of increment of the output of this amplifier??????? if yes then what will b the supply ratings?? n how much i can increase the power by doing this modification ? Thanks for the circuit. Sir I want to do it. can you please help me, just send to my email the full detailed of the circuit including the part lists(also the electronic components connection), the speaker and the power supply that I will going to used. thank you very much sir. hi everyone,those who want to get pcb layout of this circuit plz tell me on my email id rohitkumar962@yahoo.com.i will give you all detail related to this topic.thank you and love you. Do you really have the PCB for this circuit???? what is your email adress, send me on my email id. i want to do a 5.2 channel surrounding home theater without programmer i.c. I want to know a circuit design using tl 084. But the i.c is not available where i live. Plz anybody give substitiude i.c design. SEETHARAMAN sir tank u for this circuit…..
sir can u please mail me the pcb layout of this circuit…. Hi… can we use torroidal transformer…? Hi… plz provide the transformer specification and as well as recommended power supply circuit to the amplifier. Hi Pramod you cannot, as 36-0-36 AC at transformer secondary will produce a DC of +51 â€“ 0 â€“ -51 volts. it will blow all the components. The maximum allowable transformer secondary rating is 25-0-25 volt RMS AC @3Amps, will develop around +36 -0- -36 volts DC best suited for this amplifier. hi everyone,transformer for this circuit is 26-0-26 ac.it gives 40-0-40 dc.for example ac i volt when we convert it to dc it become 1.4142volt dc. hello dude…….frm ac to dc. dc is decreased……or say less valued then ac….. THANKS SIR I GOT A BIG KNOWLEDGE FROM THIS CIRCUIT& I BUILT IT. IT IS WORKING.THANKS AGAIN ! I USED B857 FOR 2N6107,D313 FOR 2N5294. hey guys, if any one is new to electronics and want to build or design his/her own sound systems then please visit my blog. containing all step by step instructions for building any kind of amplifier. I have started it from the very basic. i have started this platform for all people who find their great interest in making their own circuits. SIR CAN I USE +36V / 0V / -36V 5A TRANSFORMER ? Hi Pramod you cannot, as 36-0-36 AC at transformer secondary will produce a DC of +51 – 0 – -51 volts. it will blow all the components. The maximum allowable transformer secondary rating is 25-0-25 volt RMS AC, will devolop around +36 -0- -36 volts DC best suited for this amplifier. sir please send me replacement for all of this transisters.if i use this replacement do i have to change transformer or any other part ? Any one can sent me the pcb design plz? I never use before,i am now going to try. Hi Sairam Sub woofer is the the one which reproduces below 140Hz. This cannot be heard but can be felt by body hence no directivity. One amplifier with suitable low pass filter getting the signal from both left and right channel information with a sub woofer box will take care of it. For left and right speakers you require a stereo amplifier to amplify left and right signal seperately and reproduce, which will give you the directivity. Hi Predencio you can use. can i used 24v-0-24v 6A for this circuit? hello sir can i used 24-0-24v 6A for this 100 watt subwoofer amplifier? I have all the required Parts for the 100 watt sub woofer amps. but without PCB I am little confused.If any one can send me PCB design will be great help for me. hi dear seetharaman sir , this amp is good and its still working without any probelm. miss you and love you. you are one of the favorite person in my list. I made this circuit but power both transistor 3773 heatup withing few seconds, speaker is humming without a signal, voltage between speaker about 10V. sir what would be the solutions? My transformer provide 35v, 0v, 35v. so how can i create +35v , -35v ? I am using this amplifier for the last one year.It is working fine and i am satisfied.You helped and guided me a lot during this project.Hope you r doing good.Always remembering your help. i want to made a simple circuit with woffer and spekar so how..??? give me daigram pls….. its my project nd by net i get a circuit but its very complicated so…..
hello sir please tell me how can I add a bass and volume controller to this circuit????? thanks again for your support and feedback. Hi Pankaj you have to use 2N5294 only. since 2N5296 VCEO is only 40 volts. With DC + – 28 volts the circuit should work but will give you lesser wattage. With 18 volt transformer you will get only + – 25volts. try to use recomended components or else the circuit may not give satisfactory results. The component values are calculated for a particular supply voltage a deviation of a maximum of 10% only allowed. sir please help me my circuit is not working…. thanks a lot sir but in my location there is no such person. is it possible that it is due to my power supply because Iam using +/-28 volt power supply????? In the power supply Iam using 18-0-18 volt 5 amp transformer. and sir Iam not able to find 2N5294 so Iam using 2N5296 is it possible that the problem is due to that transistor?????? Hi Pankaj check all your wirings transistor pins and diode polarities value of resistances capacitor polarities etc. Still if you are not in a position to fix the problem and if you are new to building of high power audio projects, please approach any knowledgeable electronic hardware engineer nearer to you, by physically viewing and analysing your assembly. Sir My circuit is not properly.Iam using a +/-28 volt 5A power supply.But my speaker is only humming doesnt produce any sound and the transformer starts burning after few seconds.Please suggest me appropriate solution…..
hai sir, my hobby is electronics all my knowledge came from my own interest and patience i didnt go to school. im studying electronics on my own. and its hard. so please help me sir. Hi Srinivasan you can connect it only through bass boost amplifier low pass filter is not required. if i can , where i can connect low pass filter input or output stage ? I am building an infrasound device to be used in a spook house for a chairity fund raiser and need to build an amplifier that will not filter out the signals below 22hz. How do I configure this amplifier circuit to do this? Hi Srinivasan The recorded MP3 CDs are compressed ones they will produce only a flat response(but for the few genuine good quality recording). You can add a bass boost pre amplifier before feeding it to this amp. In the net you get plenty of such bass booster schematics use on of them. Hi seetharaman sir, when i using orginal dvd or audio cd , i am getting good base effect form this amplifier , but when i using mp3 cd’s i could not get same effect even half also , what is the reason ??? what can i do for that ? Hi Sujeesh use our subwoofer filter. sir..what type of heat sink the ,main transistor need…can i get an image of assembled this circuit..
Hi Srinivas the relation for the output power is square of the voltage swing available across the speaker leads divided by the impedance of the speaker. if input voltage is decrease below 30-0-30 then out put RMS power will decrease ???? sir,i too think so..but i use a cooling fan also with it…does it can compansate it…?? Hi Ajith it should not become too hot it looks like your heat sink is insufficient, try using a bigger extruded alloy heat sink. hi to everyone, i want to tell you that for good quality sound and high bass 2n 3773 is responsible. it made by many company like bel,toshiba,motorolla,china and local in delhi. you will get bad low quality in local and china made transistor of cost of 5 Rs. rest are cost of estimatly 50 Rs. so purchase right one for circuit. Dear Mr. seetharaman , can u please give me two channel switching circuit using audio signal detection that means one line normal condition , if 2nd channel audio signal detected 2 channel to be active and first channel to be disconnected. hi to everyone, i love this website and dear mr. seetharaman. this is not only a place where we make these projects and discuss. how we love each, to each other and respect. i am very empressed by you all and specially mr seetharaman. now i will give you, all my experience.May God bless you all.best wishes for holi. friends…i have a stereo amplifier..i would like to set a sub woofer to that amp..i got a sub board and i connected it…but the beat is very low..may i give the output of sub board to stk 4141 board and amplify it…my power supply is 12 0 12 3A transformer…is it enough..or any other reasons???? Hi Alam Both are very important. a good amplifier with lousy speaker or a distorted low power amplifier with very good speaker is of no use. A rigid sealed enclosure is a must. the speaker can be little less rated than the amplifier for the best performance. A 100 watts @ <1% distortion amplifier with say 80watts 12" speaker or 40watts 2 nos 8" speakers in rigid sealed enclosure can give high quality thumping bass. thanks a lot for ur time and advice . thanks seetharam sir…i got ur mail. Sir.have a ups transformer with rating 6-0-6 />20amps[500va].can i use this transformer to obtain 25-0-25 /5A.,. can u help me with the circuit I have almost built it twice but still its not working.I have checked the transistor they are connected in right way .I have used c3 6.8uF 63v instead 0f 10uF and transistors bc547 instead of bc108. is it because of the bc547??? all my capacitors are rated above 100v except c3. sir..my e mail id is..
sir..i made this circuit..but its does not give any outputs.. When i connected to supply both 3773 get heats up within seconds..how can i test the circuit…..sir,what may be the problem?pls help me…i made this circuit for my mini project at my clg…..
HI SRINIVAS HE IS CORRECT THE SAME I HAVE MENTIONED MUCH EARLIER ALSO. hi to everyone, i want to tell you all that amplifier works fine and this circuit is high bass than 5.1 home theater. i already built it with the help of dear mr. seetharaman. he is a great person.there is one mistake in this circuit that c2 polarty is wrong conected. so kindly change it . otherwise there is everything allright. while making this circuit i face some probelm and i want to share it with you all. Hi Ajith a subwoofer amplifier is an amplifier with a good low frequency response and with a power of not less than 40Watts RMS at less than 1% THD & with good transient response. can anyone help me with this circuit please…. i have built this circuit but its not working .all my capacitors are rated above 100v except c3 which is 63v.used 2n5296 instead of 2n5294. c1 is 0.47mfd instead of 0.22mfd tested it with a 24-0-24 supply.Rest all are same components. what should I check in the circuit..
sir ,what is the difference between an ordinary amplifier and amplifier designed for subwoofers?? gud day sir seetharaman ..! i want to build your featured subwoofer amp..can i ask for the pcb layout of this amplifier..pls email me..Wall.regor@yahoo.com. thanks in advance sir.. your reply is highly appreciated..
Hi Srinivasan check the DC voltage across speaker. It should be zero. if not one may draw more current than the other. you may adjust the value of R11 or 12 till it becomes minimum, the problem is due to mismatch in the components. hi seetharaman sir, you are great and i thanks to you very much for help me. now my circuit is working fine. Hi Rohin check your email for my detailed reply. 2.1 channel amplifiers contain transformers in them but try to keep a bit far from the speaker.Try to shield the transformer if not leave it as it is. my STK4141 II amplifier board. Please help me with TOTAL amplifier circuit of the same.